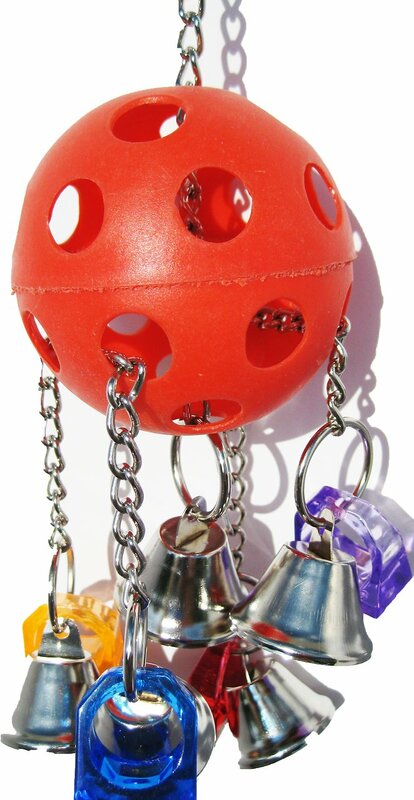 Delight your feathery pal with great sounds coming from the Bonka Bird Toys Bellpull Bird Toy. Made with dangling bells and colored acrylic rings, the bright colors are sure to attract your pal and keep his attention for hours of fun and entertainment. This plastic toy is easy to clean and durable for long-lasting fun. Measuring approximately 9 inches high by 3 inches wide, it comes with a quick link, so you can easily place it inside your bird’s cage. Watch as your bird pulls the chain from side to side while practicing for his circus gig as an acrobat. Plus, fill the whiffle ball with paper or treats and turn it into a foraging toy. A visual treat and foraging fun for your bird made with colorful adornments for him to make noises with or climb on. The chain pulling effect will keep your bird entertained for hours, plus you can stuff it with paper or treats and turn it into a foraging toy. Bird toy is a multi-playground with brightly colored charms and golden-colored bells, so no matter what, he’ll be entertained. Measures approximately 9 inches high by 3 inches wide, so it’s great for a small to medium-sized bird of all life stages. The plastic ball is easy to clean, it has a quick link for easy placement inside the cage, plus it’s made in the USA. My bird who is worse than my dogs when it comes to destroying toys, have not completely destroyed it. So that's great news! My bird love it! Bought two of these, one for my AG, and one for my Senegal. They were instantly drawn to it and have been playing with them nonstop! Now I just need to get one for my Budgie! 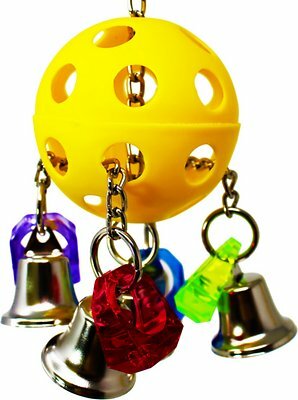 Great quality, lots of bells and chewy plastic rings. My bird liked this one! Cheery Sound And Holiday Look For Both Bird(s) And Pet Parent(s)! If I still had my birds, I would have bought this for my birds, too! Great loneliness-beater for both bird(s) and pet parent(s)! I usually hesitate when buying a new toy. will Odin like it?? well....this is his FAVORITE toy now!! he LOVES IT!!!!! I like to change and rearrange the toys in my parakeet cage every three months or so. I purchased this because it looked colorful and shiny. Even though I think it is made more for a cockatiel, both my parakeet of it. My Green Cheek Conure loves this toy. She gets a kick out of ringing the bells.